To never open, sort and distribute a piece of business mail again? Seems like a dream doesn’t it? Companies still battle with managing their incoming paper trails. For organisations that deal with a large number of suppliers and customers across different sectors, paper documents remain the dominant business medium. Our getsix® ‘Digital Mailroom’ services stand apart by optimising both the mailroom and critical downstream business processes. An increasing number of organisations have recognised the efficiencies in outsourced mailroom management to a dedicated provider, including envelope opening, sorting, validation, scanning, data capture and routing. 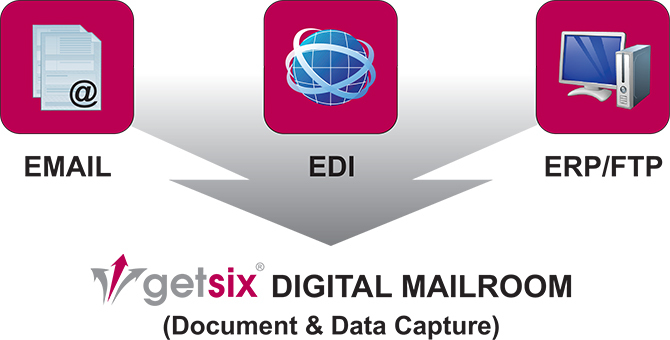 getsix® ‘Digital Mailroom’ provides a streamlined, auditable mail process that eliminates lost or unaccounted for documents. What is a ‘Digital Mailroom’ and how does it work? In simple terms, a ‘Digital Mailroom’ is an outsourced service where your post is delivered to a PO Box, sorted, scanned, and uploaded to a convenient location for you to read it. The post is sorted to your own personal specifications, getsix® can weed out the junk mail, we can bank your cheques, and we can sort it, so the right person gets the right mail. getsix® are different to other ‘Digital Mailroom’ providers, as we do not use digital mailroom software that needs to be installed. We can upload into your existing electronic document management system, offer you an online option, FTP your scanned mail, or email it to your inbox. We provide a complete bespoke service for you to read your mail remotely or locally on your own PC. If you decide to use getsix® online hosting system, our getsix® ‘Customer Extranet’, based on Microsoft SharePoint, all your scanned mail is held online and backed up with us, indefinitely. You get a disaster recovery solution for free. In this case you can read all your scanned mail remotely as well with your mobile device. The benefits of outsourced mailroom management are immediate for both large and small companies. The digital mailroom demands a very quick turnaround from receipt of mail at getsix® premises to the mail being available for viewing or downloading as a PDF. You will get dedicated production team members who will sort your post, prepare it and scan it. getsix® also have a customer service executives who will help you every step of the way, as you set-up your mailroom and with any queries you may have in the future. Outsourcing the post room can bring a number of immediate benefits and cost savings to the organisation. Paperless environment: Having a ‘Digital Mailroom’ is a step on the ladder of achieving a paperless office and helping towards that environmental certificate. You will also have a disaster recovery solution in place in case anything disastrous happens. If you own a small business then it is highly likely you do not have a mailroom and receptionists available to take in your mail, open it and action the contents. getsix® will take delivery of the company’s mail, sort it to your instructions accordingly, scan it, upload it, email it, or FTP it, ready for you to read. There are no set-up fees with the ‘Digital Mailroom’. You pay a monthly fee, decide what you want scanning and uploading and there you go… the mailroom is set-up.There is no expensive bespoke software involved. You have a username and password, go online and your mail is scanned and uploaded daily ready for you to read from any location, using getsix® ‘Customer Extranet Document Management System’. If you have your own system, we can upload into that as well, in fact. Do you work from abroad and have clients in Poland? Access your mail from Poland online and daily from anywhere in the world. Not only can we scan your mail, but we can scan any other documents you wish to have access to. With a ‘Digital Mailroom’, you can also work from home, but have all your business post sent to getsix®. Handy if you do not have a business address yet. You will also have a disaster recovery solution in place. Storing your documents online is a much safer option than filing your business mail on your premises or at home. The key to mailroom efficiency is converting paper into digital documents and automating onwards processing of critical mail items. getsix® ‘Digital Mailroom’ services allow you to centrally capture, route and process mail items by merging all incoming information into a single mail handling process. getsix® respective ‘Digital Mailroom’ services are suitable for: correspondence, expense reports, return mail, application forms, contracts, invoices, delivery notes, orders, etc. 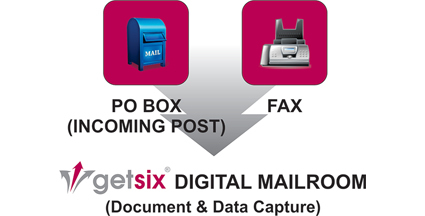 getsix® create a mailbox for your paper-based documents. At our service centres in Wrocław, Warsaw and Poznań all incoming mail is scanned, analysed and interpreted, that is, classified into business cases and made available to subsequent processes. As a getsix® customer, your business would have a dedicated PO Box, managed by us. All incoming documents are opened, sorted and categorised, then scanned on our Canon best of breed scanners for high quality images. getsix® sophisticated Kofax OCR/ICR software extracts as much data as you require and all data is then verified and quality controlled. getsix® also can provide the Kofax Front-End Software in your premises in a SaaS Model, so that you could use your own scanners and staff to scan the documents, without investing in Data Extraction Software and BPM Solutions. Regardless which of the 3 channels is used the information from incoming emails and e-documents, along with attachments, are placed in a standardised structure, so that they can be analysed and their content classified. They are then fed into the corresponding follow-up process. The final data and images are returned by secure FTP connection, ready for use in back office systems. Companies using electronic document and record management systems (EDRM) also gain the ability to have the scanned images and index data automatically uploaded into their archives. Why choose getsix® for automating your mailroom? Automating routing of mail items into business workflows. You can choose how you to receive your digital mail – as email, on mobile devices, through file transfer or via our electronic document management solution – SharePoint. Reduce risk of manual processing errors and eliminate any delays in distribution of paper mail.